A comfy pair of pants from a feel-good company! You must remember our friends at Toad&Co, who brought us their Debug Range Pant, a fantastic pant to help keep you bug-free when you hit the trails. We’re excited to introduce you to their Earthworks Skinny Pant, another winner from their Fall/Winter line. Toad&Co has taken eco-friendly to the next level in that 98% of their new collection is sustainably-made with at least 80% sustainable fibers and/or fabrics that are third party certified for responsible manufacturing. There’s no industry standard or regulation that defines eco-garments, but Toad&Co has launched an awareness campaign in October titled, Save the Planet. Wear Sustainable. They hope to emphasize responsible consumerism by making sustainable choices. 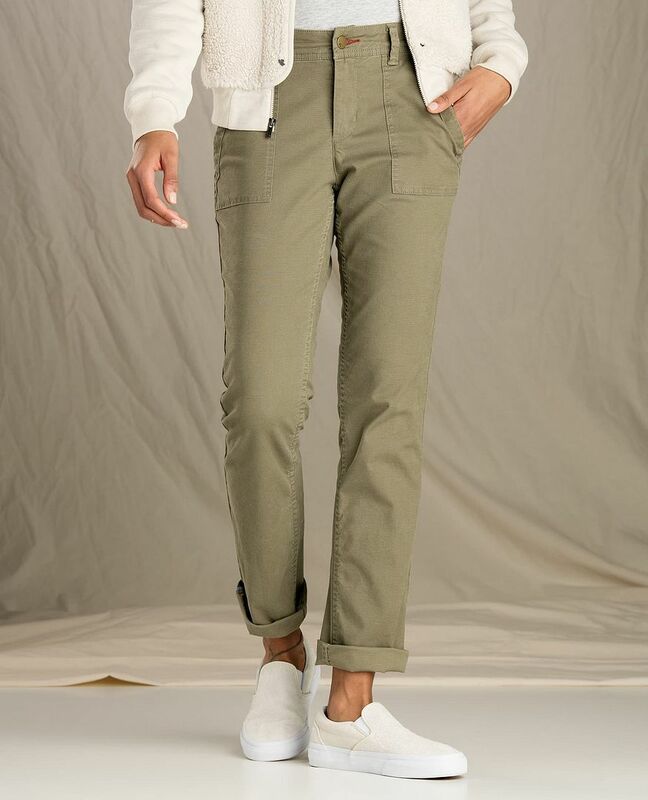 With this in mind, the Earthworks Skinny Pant is constructed out of organic cotton and Tencel, a fabric made from certified sustainable eucalyptus trees that is moisture-wicking, durable, low-maintenance, and naturally inhibits the growth of bacteria. A touch of Spandex gives these super soft pants the stretch that makes them ultra-comfortable and ultra-moveable. The FlexForm Waistband Technology ensures a perfect fit without any gapping or pinching. And the styling of these pants make them a no-brainer for a well-put together look on the trails, traveling, and socializing about town. The Earthworks Skinny Pant is yet another noteworthy item from our friends at Toad&Co!